Baltimore Catechism No. 2 for Confirmation, grades 6-8 and high school. The Baltimore Catechism No. 2 has all the questions from the Baltimore Catechism No. 0 and No. 1 in one booklet. It also has many more catechism questions to help children to an elementary school understanding of the Catholic catechism. If you have the No. 2 you will not need the No. 1 or the 0. No. 0 and No. 1 are usually used for First Communion preparation while certain questions of the No. 2 are marked for memorization in preparation for Confirmation. Both First Communion and Confirmation are included in the second book. Those who are new to the Catholic Faith only need the No. 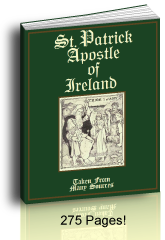 2, since it includes the answers and prayers that are in the two other booklets and covers preparing for Baptism, Eucharist, Confirmation and Penance. An adult would only need the No. 2 as it really does cover most of the questions that most adults ever face. The No. 3, or the excellent Catechism Explained are much more comprehensive adult catechism books. I'd skip the No. 3 and move straight to The Catechism Explained as it covers the Baltimore Catechism, and adds saint and Bible stories as well as examples from history. The Baltimore Catechism is especially handy for Catholic Religion class, Sunday school catechism, RCIA, and Catholic homeschool. It is the definitive book by which most catechisms written in English are compared, at least those in the United States of America. The questions are plain and the answers directly correspond to the questions in a direct and concise format. This makes the answers easy to learn and to memorize. The Baltimore is the basis for many Confraternity of Christian Doctrine (CCD) catechism versions in the USA since the 1940s. Some versions were better than others, which is why so many people want the 1885 reprints. It's hard to trust re-writes. One of its best features of the old version is that it asks the questions with easily memorized answers. The answers, if answered completely using the words of the question in the answer, offer a concise statement of the Catholic faith. Oh, what a treasure this is! Concise answers not only give certitude they are also more easy to use in real life through the years, thereby aiding us in final perseverance, the one thing necessary. I am particularly glad to have used this with our children as there have been few times when they were confused and these the answers were plain and to the point. What is the difference between the No. 1 and the No. 2? How do they compare? Fewer than 400 Questions from the No. 2. Generally used for First Communion (through lesson 20 plus the prayers and Ten Commandments). More questions and answers included for better preparation for Confirmation. Daily Prayers - Lord's Prayer, Hail Mary, Apostles' Creed, Confiteor, Acts of Faith, Hope, and Charity, Perfect Act of Contrition, Blessings Before and After Meals. Phoneticized Words, and Word Meanings pronunciation guide and vocabulary at the beginning of each section. More Prayers - Devotions during Mass, Right Manner of Confessing, Titles of the Fifteen Mysteries of the Rosary. Words to the old hymns. #152 ff Indefinite article instead of definite article in definition of several of the sacraments which is not as exact or defining as saying Baptism is the sacrament, Confirmation is the sacrament. With this last consideration, it took me years to find that the answer to this issue is in the 1917 Code. It involves whether the primary purpose of matrimony is the love of the spouses for each other or for the procreation and education of children. If you're teaching little children, leave this question off your list. If you're teaching older children, settle the question first. On page 649, "... the principal object of marriage, [is] the right training of children." On page 663, "Of all parental duties, that of training their children in the fear of God is the most important; for on the manner in which it is discharged the temporal and eternal happiness both of parents and children will depend." There are wonderful explanations in the full chapter on Matrimony. TAN Books and Baronius Press are major publishers of these books. TAN's 1977 version of the BC is from the original by the Third Plenary Council of Baltimore in 1885. 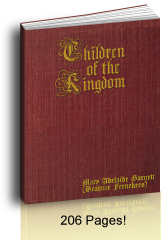 TAN used the 1933 Benziger edition that had added word meanings to the top of each chapter. It also notes new rubrics as of the 1970 calendar. To add spice to your research about who wrote this catechism, see the old TAN's CathTruth American History article [Old web address: http://www.cathtruth.com/catholicbible/amerhst2.htm] to see several warnings by Pope Leo XIII in Testem Benevolentiae). The Baltimore Catechism No. 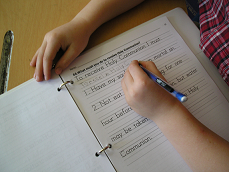 2 questions for Confirmation preparation frequently require a good deal of study. St. Anne's Helper helps you learn the basic Catholic beliefs for Confirmation. 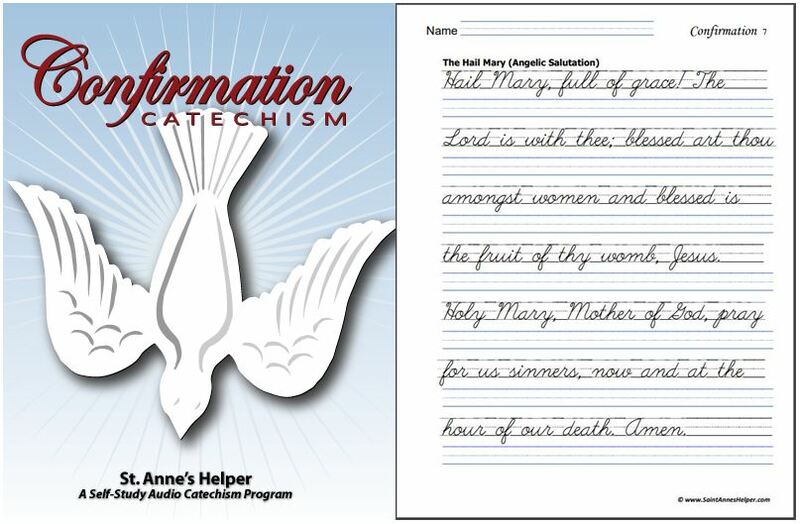 They can help reduce the time and effort necessary to learn the catechism questions and answers! Adults appreciate the benefit of an audio book to be able to review Confirmation catechism answers while driving or doing light chores. Parents and children appreciate the benefit of ambient learning while riding to and from church, school and errands; or while coloring and doing other craft projects. Catechists appreciate having printables for catechism class. Which answers are right? Perhaps you are searching for the best answers for Confirmation preparation? 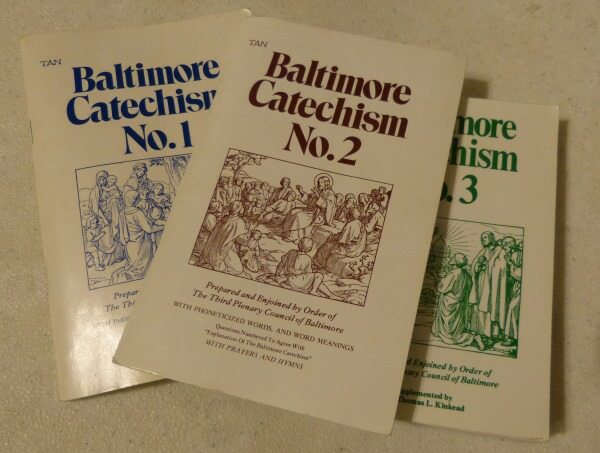 No matter which program you use, the definitive and concise Baltimore Catechism No. 2 gives you confidence in learning the basic Catholic beliefs. An audio recording makes it easier to review and memorize the answers and prayers. 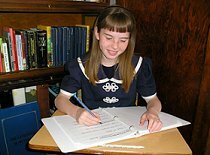 Once we realized the benefits of Catholic copywork, we made up Catechism copybooks for learning to spell the words, write the answers and for penmanship practice. What better Catholic copywork than the Confirmation answers from the Baltimore Catechism No. 2? It is a magic moment when a student WANTS to write beautifully, he or she then CAN write beautifully! On top of this they learn their faith and how to use and spell the vocabulary. 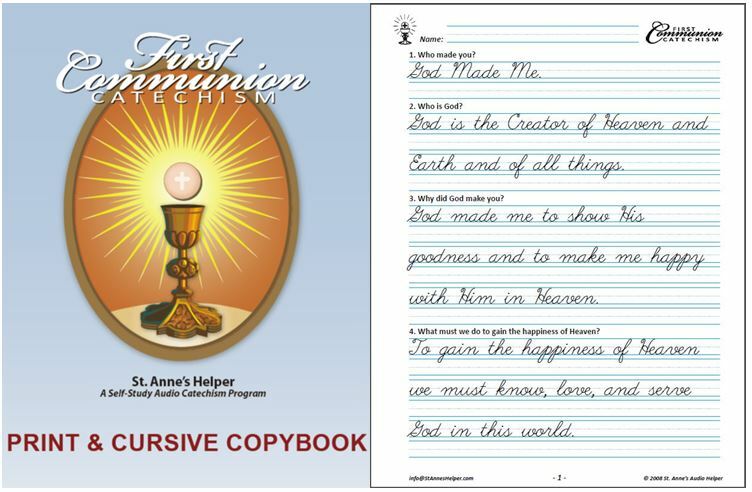 You can order Saint Anne's Helper Confirmation Catechism digital downloads here. See Seton's great defense of the Baltimore Catechism.